As we enter Coolessay.net website, we see overwhelming amounts of text. The website is not impressive. As already mentioned, it has a lot of text - just about enough to get the visitor confused and make it hard to find their way around. For example, we could not find a comprehensive list of the assignments that this company is ready to accomplish. However, they do claim to deliver a completely original paper free of any plagiarism, and the rates seem quite reasonable, too. It looks like Cool Essay is also popular among the clientèle, judging by the amount of positive reviews and testimonials from happy customers. So, we have decided that Cool Essay is worth checking out. As you know, there are dozens of custom writing companies on the market. The range of services that they actually offer, however, is not always the same. This is why these services should be listed. We fail to find such a list at Coolessay.net website. The disclaimer at the bottom of the page mentions that the company offers “custom written research papers, term papers, custom thesis, custom essays, etc.”, but this is as detailed as it gets. Finding the pricing was easy, though. The prices start at $10 for a one-page essay of high school level with the most relaxed deadline of two weeks. As you choose higher quality and nearer deadline, the price per page increases, and a page of a doctoral-level essay to be written as soon as possible may cost up to $49. Such pricing is quite common for the custom writing market. A pleasant perk with the pricing calculator here is that you can choose your currency out of four options: US Dollar, Canadian Dollar, British Pound, or Euro. On the left side of the website, they list the “free” services which allegedly allow the customer to save up to $115, such as free title page or free bibliography. This is not an entirely accurate piece of information. The truth is that those “free” services are all integral parts of the writing process. Nobody submits a paper without a title page or bibliography, so these services are also free with other writing companies. Therefore, you can safely disregard this list of “free” services. As for Cool Essay's discount and special offers, they are not pronounced. The only mention is in the FAQ section of the website where they suggest that the customer contacts the customer support for the current discount codes. The easiest way to save money, though, is to order your paper early: the price will be significantly lower with a fourteen-days deadline than with a four-hour one. Upon careful reading, the texts on the Coolessay.net website prove to be full of grammatical and spelling errors. This does not speak in favor of their authors' literacy. Cool Essay claims that they only work with authors from the US, Canada, and the UK. While these writers might be native English speakers, but there are ESL people who write better. Yet, the website content must not necessarily be written by academic writers, because content writing and academic writing are different fields of expertise. So, we decided to test Cool Essay's services and ordered an essay with a very short deadline. While it was delivered on time, it was full of grammatical and spelling errors, just as we expected. To their credit, however, it was written quite creatively and in accordance with all the format requirements. The website offers a toll-free phone number for the US and Canada, but they are hard to reach by phone. You can also find their physical address on the website, but this is also not a very convenient way to inquire about the progress of your order, for obvious reasons. The best way to reach them is via the live chat available on the website. The live chat support is friendly and professional, it is 24/7, and they respond quite promptly. 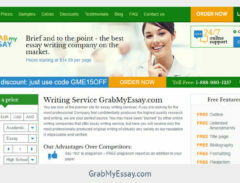 CoolEssay.net does not exactly represent itself as a top quality essay writing service. Their writing is full of mistakes even on the website. However, they are quite affordable. So, if you are on a slender budget, you can address them, and then simply proofread your paper yourself. If you are on a tight deadline, though, you'd better seek assistance elsewhere.